Artichoke Stuffed Portobellos are scrumptious and make a handy appetizer or side dish that can be served with ease and elegance. In this stylish treatment, baby Portobello mushroom caps are topped with a heavenly velvet-textured filling and baked in a hot oven. Portobello mushrooms are actually mature Cremini, or Italian brown mushrooms, that have been allowed to ripen up to seven days longer. As a result of their longer growing period, Portabello mushrooms develop much larger caps that average up to six inches in diameter. Smaller baby Portobello mushroom caps are about 2 1/2 inches in diameter and are sometimes called stuffing Portobello mushrooms. The creamy, rich filling is as simple as it is tasty and comes together quickly in a food processor or blender. In this dish, easy to use wholesome alternatives reduce fat and eliminate cholesterol. Lite Silken Tofu, canned, quartered artichokes, leeks and nutritional yeast combine with seasonings to create a richly flavorful filling and can be made in advance and refrigerated before assembly. 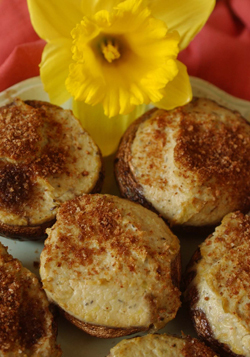 The filling is mounded onto the mushroom caps and sprinkled with whole wheat bread crumbs just before baking. Preheat oven to 350°, Spray baking pan with oil.Wipe mushrooms with a damp paper towel and remove stems, leaving caps intact Place mushrooms on a baking pan cavity side up, and set aside. Place the tofu in food processor and blend. Add peeled garlic and process. Add artichoke hearts, process and add the leeks and remaining ingredients. Process. Spoon filling into mushroom caps and sprinkle with bread crumbs. Bake 20 minutes. Serve Hot. Nutritional Yeast - Adds rich, creamy, cheesy flavor, rich in protein and B vitamins - Vegetarian Support Formula is the only nutritional yeast containing B12. Do not confuse with brewers yeast, which has a bitter taste or bakers yeast, used to leaven baked goods. Leeks - Look very much like an enormous scallion and lend subtle flavor to the delectable filling. Because they can be very gritty, it is important to clean leeks thoroughly to avoid unpleasant residue. Trim the roots and ends, and without cutting all the way through, slit the leek along the side. Fan the layers open and rinse thoroughly under cold running water. Finally, soak the rinsed leeks in a large bowl of cold water, changing the water several times, until no grit appears in the bottom of the bowl.